The solar system is the set formed by the Sun and the eight planets with their respective satellites that rotate around it, also accompanying it in its displacement through the galaxy or Milky Way dwarf planets, asteroids and countless comets, meteorites, and interplanetary corpuscles. This system is located about 33,000 light years from the center of the Milky Way. The solar system is the set formed by the Sun and the eight planets with their respective satellites that rotate around it, also accompanying it in its displacement through the galaxy or Milky Way dwarf planets, asteroids and countless comets, meteorites, and interplanetary corpuscles. Where is Solar system Located? This system is located about 33,000 light years from the center of the Milky Way. There are many hypotheses about the origin of the Solar System, the most current theories link its formation with that of the Sun, some 4,700 million years ago. From an interstellar cloud of gas and dust that fragmented or collapsed, leading to the formation of a primordial solar nebula, and through the union of larger and larger particles the formation of today’s planets. Until August 24, 2006, there were nine planets in the Solar System: Mercury, Venus, Earth, Mars, Jupiter, Saturn, Uranus, Neptune, and Pluto. 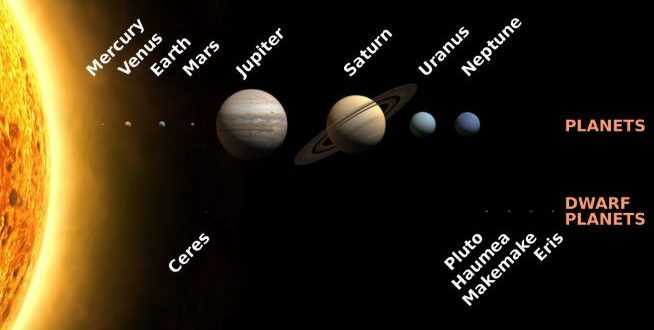 On that date, the International Astronomical Union created a new kind of planet: the dwarf planets, where Pluto became part of them, along with Ceres and Eris; and later, Haumea and Makemake joined them. Planets are bodies that move in elliptical orbits around the Sun (translation) and around themselves (rotation). Generally, the distance from each planet to the Sun is twice as far as the previous one. The planets, with the exception of Mercury and Venus, have satellites, smaller bodies revolving around them. The best-known satellite is that of the Earth, the Moon. The planets closest to the Sun are called inner or telluric planets (Mercury, Venus, Earth, and Mars), they are small in size, high in density, low in rotation speed and have few satellites; distant planets are known as outer or giant planets (Jupiter, Saturn, Uranus and Neptune), are large in size, low in density, fast rotating and have gaseous consistency and more satellites. Jupiter is the largest planet, while Mercury is the smallest, Venus in terms of mass and size has characteristics analogous to Earth, and Mars known as the red planet is half the mass. Apart from these main planets and their satellites, there are thousands of small bodies known as asteroids, which are located between the orbits of Mars and Jupiter, in a strip called the asteroid belt. Also, we can’t forget the comets (ice balls and dust) and the meteorites. Pingback: Why is tonight the best time of the year to observe Jupiter?